In the bitter feud between tech firms and the taxi industry, drivers fight back with a killer app of their own: cooperative ownership. The largest taxi company in the Denver metro area is still mostly secret. On Sunday morning, the parking lot behind the Communication Workers of America Local 7777 office filled up with cars. Some already had the black or green paint of Green Taxi Cooperative, its name inscribed in Wild West-style type. 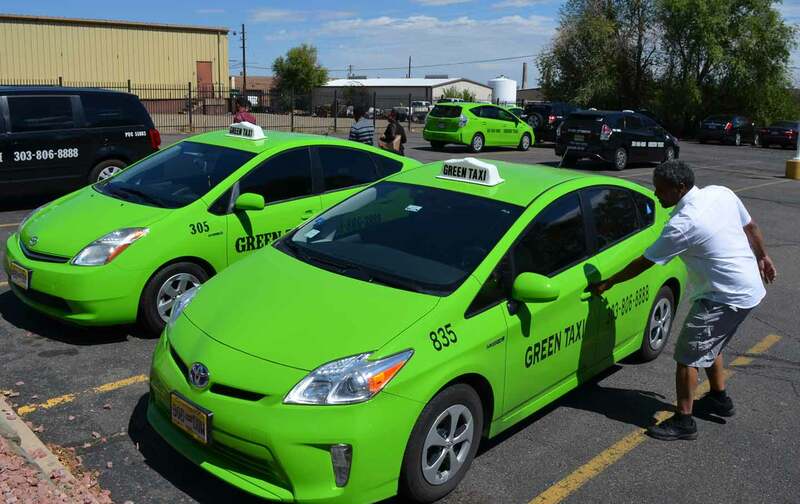 But many were still unmarked, or bore the branding of one of Denver’s other cab companies, for whom drivers were working even after putting down the $2,000 investment to become a member-owner of Green Taxi. Some were still doing Uber. 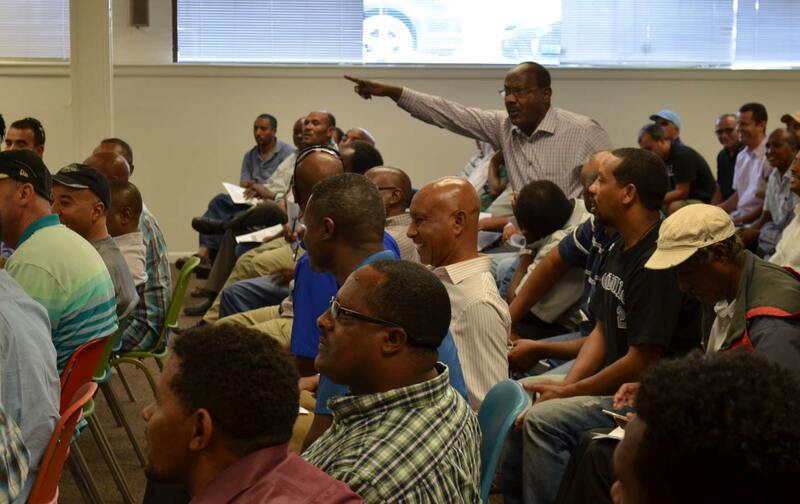 All 800 slots for Green Taxi members are full, and there’s demand for more. But nearly 150 drivers are out on the road so far. The rest are waiting, keeping their status as business owners quiet, biding their time to see if this will really work. “I’ve never heard of a meeting on the Sunday before Labor Day,” Shiela Leider, the local’s political director, told the assembly of about 90 co-owners, nearly all of whom were born and raised in places where Labor Day does not exist. With the backing of CWA, including an office Green Taxi rents in the local’s basement, Buni and his fellow founders have been clearing regulatory hurdles since 2014. The company’s slow, quiet start began when the office opened on July 1 this year; the first cars hit the streets later that month. It’s part of an international surge of taxi co-ops that are trying to turn the industry’s disruption-by-app into an opportunity for worker ownership—in suburban Virginia, in Portland, in Grand Rapids, as well as throughout Europe and beyond. Green Taxi’s scale, however, is especially ambitious. For the local taxi scene, it’s game-changing. For members, it’s a necessity. “I paid extra to use the owners’ license before,” said Kidist Belayneh, who has been driving taxis about half of the six years since she moved to Denver from Ethiopia. “Now I’m an owner. We don’t pay extra.” She was one of just a handful of women in the room. She’d never felt tempted by Uber. The trouble, however, is the airport. In a car-culture city, the backbone of the taxi industry is the $55.57 flat-rate fare between the airport—nestled in the high prairie, far from everything—and downtown. It’s $88.57 to Boulder. And according to how the airport has typically granted permits, proportionate to market share, Green Taxi’s 800 members should entitle the company to about a third of the 301 available slots. But so far, the company has only received 20—admittedly, still generous considering the number of Green Taxis on the road. But with 800 drivers, according to Buni, 20 airport permits wouldn’t be enough to keep the business afloat. What’s more, the airport is planning to change the whole system, just as Green Taxi organizes to claim its market share. The airport’s website now includes a notice about an impending contract bid for taxi companies, replacing the permits. An airport spokesman told me, “That would result in a higher level of service, vehicle consistency, branding, operating standards etc.” It could also reshape the city’s taxi business, and make or break Green Taxi’s plan to cooperativize—and unionize, with CWA—a third of the market. Rumors are flying about an insider deal, and nobody at Green Taxi seems to be in on it. The airport’s new regime affects only taxi companies, but it has everything to do with the influx of apps. Unlike taxis, Uber and Lyft drivers face no restrictions on their airport usage. They often drive nicer cars and speak better English; they’re more likely to be white. In December 2014, they made 10,822 trips through the airport, compared to 30,535 by taxis. A year later, for the first time, app-based airport trips exceeded the taxis, and they’ve done so every month since. As taxi companies prepare to fight among themselves for survival, ownership, and democracy under the still-unpublished new rules, Silicon Valley’s expansion proceeds unrestrained and seems to be welcomed by the relevant authorities. The main business of Sunday’s meeting was to vote on a legally inert but rhetorically meaningful amendment to Green Taxi’s bylaws, which would emphasize that “members” are indeed “owners.” These drivers are sticklers for detail. Some have driven for two other smaller co-ops formed in recent years, Union Taxi and Mile High Cab, which allow members to lease cars to non-members. Green Taxi has set out to be different; all the drivers will be member-owners. One of them complains, “We need documentation of legal ownership. That’s why I came from my other company.” Another allows me a glimpse at his stock certificate. The first shouting match breaks out over the books. Green Taxi lost its bookkeeper, and the board has been slower than it had promised in delivering the financials to members. The hired accountant makes excuses, insisting that any excess will go back to the members and that they should be patient, but a few loud voices press on. “This is our money and our company,” one interjects. “This is not just some job.” Finally, the board treasurer offers to show anyone who wants to see them the bank accounts on his phone. Abdullah Chajari, the board vice president, adds his firm baritone to Buni’s gentler chairmanship. “If we want to win at the airport¸ we’ve got to organize ourselves here,” he says. Applause. “They want you to split. You split, they beat you.” Members get up to speak, alternating between declarations of loyalty to the board and surges of defiance, then counter-accusations against the malcontents still driving for Uber. “This is democracy,” Buni repeats as he attempts to moderate, as if consoling himself, telling himself that the voice of the people will somehow lead to the good. Proceedings continue to the bylaws, and some complain that they’ve never seen any. (They’re on the internal website, but, people say, not easy to find.) A debate breaks out about whether the members not yet driving for the co-op or paying dues should be allowed to vote. This necessitates a break, five minutes of intermingled talk, shouting, a bit of shoving, and laughter. It’s not all hard feelings. But it’s tense. I hear grumbling that the board might have rigged their election, from a candidate who lost. Jason Wiener, Green Taxi’s counsel and a rising-star lawyer for the region’s burgeoning social-enterprise sector, tries to clarify things. He breaks down the provisions of the bylaws about who gets to vote. They almost make it to voting on the ownership amendment, but they don’t. They decide to table it for later. That’s the closest thing to a decision made all day—for some, their first decision as business owners. Despite whatever powers come with ownership, so much seems out of the drivers’ control. It could be months before they know what will happen at the airport. Wiener counsels patience. “What you’re trying to do is not easy,” he says. “Try to see the long arc. You’re starting a completely different way of organizing the economy and relating to the community.” He fields more questions about the bylaws. It isn’t much longer before the three-hour meeting, ambiguously, ends. While Green Taxi scrambles to empower drivers, Uber and Tesla and Ford aim to automate them. I asked Buni about this, and he said, “We’re really trying to feed a family for the next day. When it happens, we’ll make a plan”—that is, crisis management, for the forseeable future. Still, he and his crisis-ridden co-owners have organized to pool more than a million and a half dollars to put a third of Denver’s taxi industry under worker control. Self-driving cars haven’t come to the city yet, after all. And if the drivers can earn enough to get out of crisis mode, no one will be better positioned to devise how to cooperativize the robots. Nathan SchneiderNathan Schneider is the author of Everything for Everyone:The Radical Tradition that is Shaping the Next Economy; Thank You, Anarchy: Notes From the Occupy Apocalypse and God in Proof: The Story of a Search From the Ancients to the Internet. He is is coeditor, with Trebor Scholz, of Ours to Hack and to Own: The Rise of Platform Cooperativism, a New Vision for the Future of Work and a Fairer Internet. He teaches at the University of Colorado, Boulder.